Heat a saute pan with 2 T oil. Cut the chicken into the smallest pieces possible and add the pan. Don’t worry about overcrowding the pan, the chicken doesn’t need to brown, just cook it until it’s done all the way through. While the chicken is cooking, add the lemon juice, chili sauce, soy sauce, sesame oil, green onions and cilantro into a serving bowl. Once the chicken is done, add it to the bowl. Add a few more glugs of oil to the saute pan and toss in the mushrooms, onion and garlic. Saute until golden, about 10 minutes. Add to the bowl. Toss everything around to coat. Remove the stem of your lettuce head with a knife and slice the head in 1/2, lengthwise. 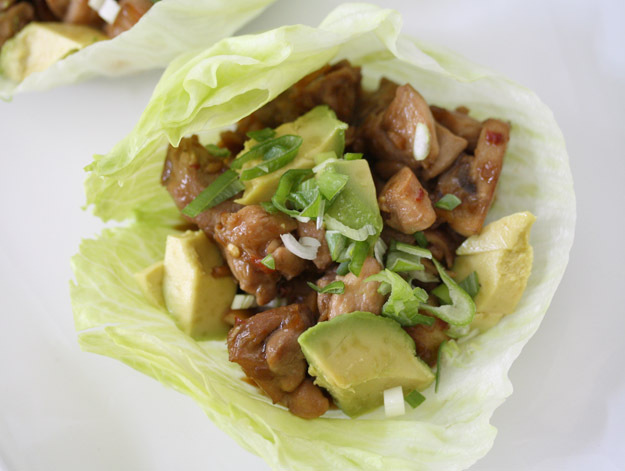 Peel the lettuce into individual “cups” and wash.
Pile the chicken into your lettuce cups and top with avocado.